Chips Moman is one of several immensely talented record producers who came out of the Memphis Music scene in the 1960's. 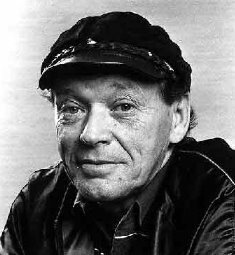 Lincoln "Chips" Moman's career began as guitarist with The Dorsey Burnette Band and recordings with Gene Vincent. There he gained early attention for his guitar combined with noted session work at Gold Star Studio in Los Angeles. However when Moman returned to Memphis, he joined Jim Stewart and Astelle Axton in the development of Satellite Records as a recording engineer. Shortly afterwards Moman encouraged Stewart and Axton to relocate the recording studio to a vacant movie theatre in South Memphis. 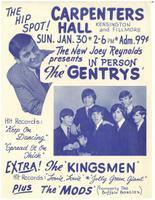 That's where Moman produced the label's first hit record titled,"Gee Whiz" by Carla Thomas. Within months Satellite Records changed it's name to Stax Records adopting it's name from the first two letters in the owners names, STewart and AXton. 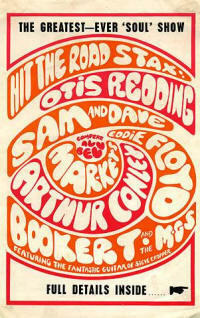 The Stax label would go on to have a string of hit records by The Mar-Keys, William Bell and Booker T. and The M.G.'s. But Moman would soon depart Stax Records over a royalty dispute from the hit record, "Green Onions" by Booker T. and The M.G.'s. Publicity shy and strongly independent, Moman would open his own recording studio called American Studio with borrowed money combined with his $3,000 settlement from Stax Records. Within the next year he would produce his first million seller on MGM Records with The Gentrys, "Keep On Dancing." American Studio would soon become a haven for the top musicians and song writers. With a prominent rhythm section established, Moman's studio became known as the studio with the formula that matched a great a song, with great musicians, and with a great production. Among the artist who made a pilgrimage to American Studio were The Box Tops, Joe Tex, Percy Sledge, James Carr, Danny O'Keefe, Bobby Womak, Petula Clark, Herbie Mann, Aretha Franklin, Dusty Springfield, Wilson Pickett, Dionne Warwick and Neil Diamond. Another Moman client, The King, Elvis Presley, regained his down-home atmosphere with Moman's studio band of laid-back musicians to record some of his greatest hits at American including "Suspicious Minds", "In The Ghetto," and "Kentucky Rain." During the period of the late 1960's and early 1970's, Moman's American Recording Studio scored an unprecedented amount of hit singles by producing more than 120 chart records. But Chips Moman wasn't through yet. In the mid-1970's he relocated to Nashville where he continued his successful writing and recording with B.J. Thomas, Waylon Jennings, Willie Nelson, Johnny Cash, Merle Haggard and Roy Orbison. Several noted hits that Moman co-wrote during his Nashville years were; "Raindrops Keep Falling on My Head" and "Another Somebody Done Somebody Wrong Song" by B.J. Thomas and "Luckenbach, Texas" by Waylon Jennings. A Gentrys Reunion. Chips Moman made significant contributions to Southern Music by mastering the blend between Country Music and Soul Music. He also conquered the pop market with his first million selling record by The Gentrys, "Keep On Dancing". 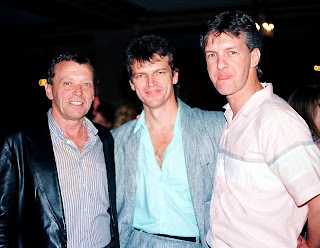 Moman (above left) reunited here in 1985 with former Gentrys vocalist/guitarist (center) Larry Raspberry and record promoter Phillip Rauls (right) who served as original Road Manager of the band. When first introduced into the music business, I didn't really expect that I'd be around the industry for four decades, from the Sixties through the Nineties. Working for several of the worlds most prestigious record labels during their most productive years offered experiences that would boggle the mind. Being on the road constantly and going from city to city provided me with many unique opportunities and a wealth of memories. Occasionally while venturing down the Yellow Brick Road, I would sometimes indulge myself into some of the many perks put forth before me. Sure, I grabbed a few back stage passes and T-shirts, plus my record collection is substantial. But next to my photographs and then my record collection, my most coveted items are concert posters. Those treasured time pieces are snap-shots of pop-culture. 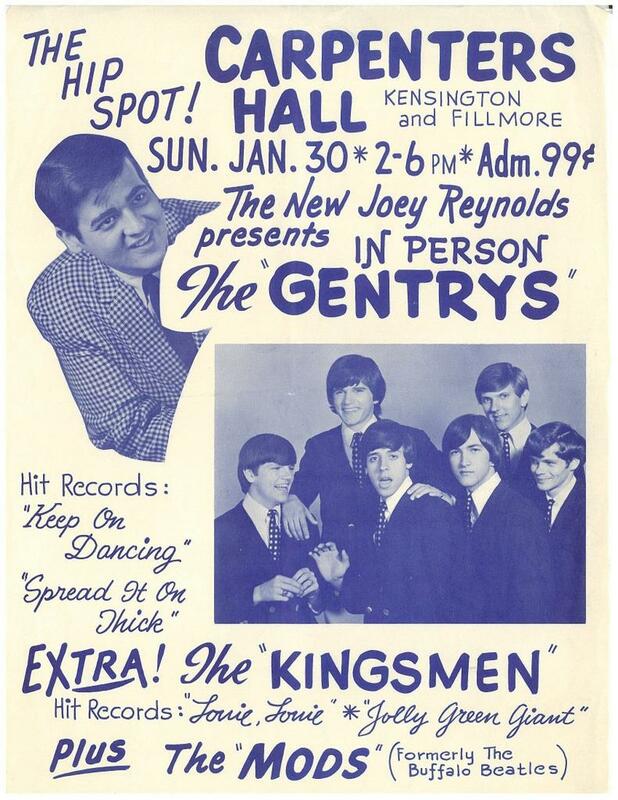 Here are some cherished concert posters selected from various sources representing a magical time period of the past. I welcome viewers to leave their comments for all to enjoy. The Allman Brothers Band launched a Southern style of music that blended Blues, Rock, R&B, Country and Jazz all packaged in a jam-oriented fusion. Whew! This classic photo shot in a Georgia creek-bed by renowned photographer Stephen Paley shall forever remain as a poster of the free spirited hippie movement. Enduring a reputation as America's best in a live rock performance, The Allman Brothers Band blazed a trail across the country from the Fillmore East in New York to all points west of the Mississippi. Previously known as The Allman Joy and later as The Hourglass, The Allman Brothers helped launch Capricorn Records out of Macon, Georgia. At the urging of Atlantic's Jerry Wexler, Capricorn Records bought Duane Allman's contract from Rick Hall's Fame Recording Studio as a staple to build a band around. 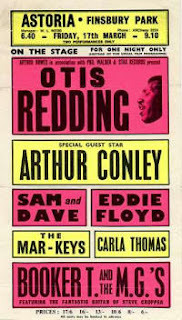 Backed by Capricorn owners Phil Walden, former co-manager of Otis Redding, and former European Manager for Atlantic Records Frank Fenter, the new label sought to establish a hold on Southern music. Capricorn was promoted and distributed by Atlantic Records. 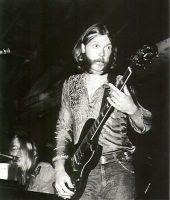 Dual lead guitars amalgamated with two drummers and a blue-eyed soul vocalist named Greg Allman, the group emulated a free spirited band who recorded mostly original material which separated them apart from the countless numbers of copy bands consisting of white boys attempting to sound black. Their first three albums remain as pure classics. 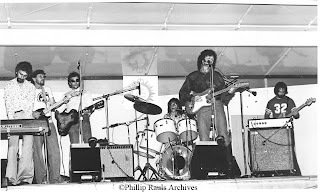 The bands anthem of "Whipping Post" stands as one of rocks most definitive improvisational collaborations while elevating Duane Allmans reputation as rocks finest slide guitarist. Duane would later join Eric Clapton on guitar in the production of the legendary "Layla" album by Derek and the Dominos. Sadly, Duane Allman was killed in a motorcycle accident in 1971. But the band would continue to tour and record despite a number of personnel changes and years of growing dissension over musical direction and intertwining circumstances. In 1995 The Allman Brothers Band were inducted into The Rock and Roll Hall of Fame. Pictured here are Gregg Allman on vocals (left corner bottom) and brother Duane on guitar while performing at a favorite haunt in New Orleans, The Warehouse. Duane Allman found early employment as a session guitarist at Fame Recording Studio in Muscle Shoals, Alabama. Seen here with Atlantic Recording artist Wilson Pickett, Allman also played on sessions for Aretha Franklin, Clarence Carter, Percy Sledge, Arthur Conley, Herbie Mann, Delaney and Bonnie and Boz Scaggs.